It’s only been a year or so since the original Skylanders first came out. I suppose that can be viewed as a good, or bad, depending on your point of view. More Skylanders figures and fun gameplay are always nice, but in only a years time could they possibly have tweaked much of the experience? I guess it depends on whether or not you can still have fun with more of the same or if you crave completely new experiences. Hmmm… I think we made a blog post about that once. Any-who, SKYLANDERS TIME WOOO! Read our full review after the break. If you already know what Skylanders is then you can just skip this paragraph. Skylanders is a toy/video game hybrid. You place little figures on a portal and they transport into your game. They level up, gain new powers and abilities, collect hats, complete challenges, etc. When you lift your figure up from the portal it retains all of its info so if you go over to a friend’s house you can just place your figure on a friend’s portal and jump right in to co-op or versus battles with your own character. The general gameplay of Skylanders is somewhat akin to a hack’n’slash or action RPG. You get an isometric, fixed camera view of your character and go through levels fighting trolls and other sorts of fantasy villains. Each character has different stats and abilities. With 30+ skylanders you get a lot of different options. The figures come in 8 different elemental types. Sometimes certain elements are more powerful in a given situation and some areas can only be accessed by skylanders of a certain element. The core audience is kids, obviously, but it’s still a whole lot of fun and appeals to a wide audience. Let’s just dive straight into the Skylanders GIANTS. They’re the biggest (I’m just going to ignore any unintentional pun here on out) addition to the game, the most interesting, and probably the Skylanders you will use most. 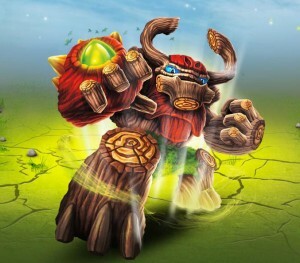 I mean, who wants to use a tiny dragon when you got this gigantic tree man or a huge hornet dude with arm blades. The toys themselves are a pretty cool sight. 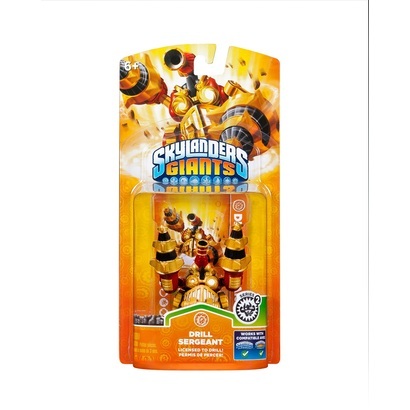 They are probably 2x larger than regular skylanders and when you place them on the portal they light up. Yeah, you heard me, those suckers shine like magic. The eyes light up along with other stuff like weapons or other features. It’s a really cool effect. In game the giants are equally as awesome. Again, large in size and visually impressive. They also seem to be way stronger than regular skylanders. Near the end of my play-through my giants seemed to have twice the hitpoints of their smaller cousins. Aside from looking awesome and being more powerful they also have the ability to break down walls, lift and hurl rocks, and even perform heroic feats of strength like pushing down stone pillars and reeling in islands. Freaking islands, man. There just doesn’t seem to be a lot of incentive to play anything but these awesome brutes. That is, until you find out all the negative points to controlling one of these behemoths. They’re huge, of course, which means it can be REALLY difficult to dodge attacks sometimes. You might find yourself in a trap or spell-dodging situation and you are just kind of screwed unless you switch out to something smaller. Not only that but they can be horrifically slow. Pray that the giant you picked has some kind of travel power or dash attack you can mash, or else you will be waddling around like an idiot. A few new figure types also show up next to the giants. 2.0 figures are returning skylanders featuring new poses and base colors. They can also obtain a new power that they couldn’t in the first game. There are also some new skylanders along with the returning characters, The new guys actually look pretty cool and make me want to pick them up. They also added Lightcore skylanders, which I’m not entirely sure about. 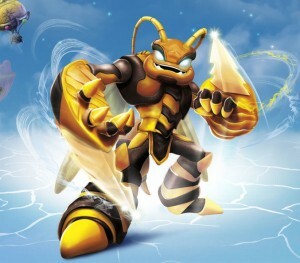 They are a special version of an existing skylander or new figure which features a unique pose and lights up when placed on the portal, similar to the giants. In game they kind of shine and do some point blank area damage when summoned. Other than that I’m not really sure what they do. Any figure from the first game also works in GIANTS. 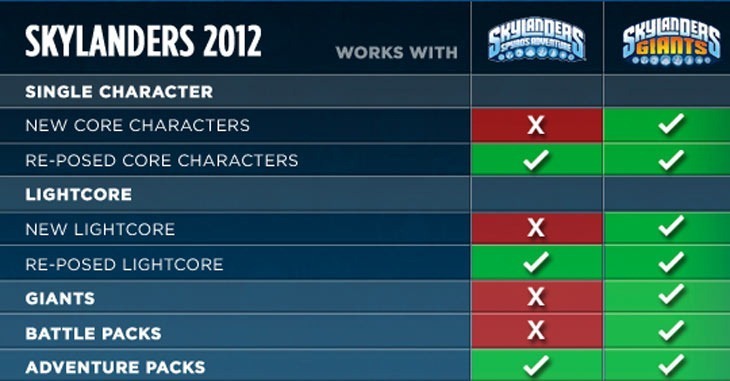 Your power ups are still helpful, and your old Skylanders have all their stats/hats from the original game, plus they can gain a few more levels. They can’t, however, get the new wowpow power. Honestly, I don’t find this to be that big of a deal. If you don’t want to buy new versions of figures you already own then you aren’t missing out on much. Your adventure pack figures also work in giants, but the levels are the same as from the first game. Still, if you haven’t played them there then pick them up. We play Skylanders Giants on the Xbox 360. Aside from those new figure types there really wasn’t much added to the game. It looks nice visually, but it’s not really any different than the first. Your skylanders still level up the same and purchase abilities, which leads to choosing a specialization. The controls are limited, just like the original. Still no jump button, unfortunately, and no block or dodge. Gone is the interesting and expansive hub world from the original and in its place is a flying ship. It’s not that big and it doesn’t feature much to do. They did, however, add a shop where you can purchase some stuff and a challenge arena where you can fight enemies in different scenarios. The turning puzzles are back from the original, but they aren’t much harder than before. They did add an interesting tile-based game called Skystones, though. It feels like a basic version of Tetra Master, the card game from Final Fantasy IX. Basically you play down tiles with a certain number or arrows on each side and try to capture enemy tiles, etc. It’s kind of fun but again, pretty basic. GIANTS does add some cool stuff but it really isn’t that big of a step. It feels more like Skylanders 1.5, intentional or not. It’s still worth a pickup, though. The giants are awesome and the game is still fun. If you have the first game you don’t need to feel pressured into rebuying figures. I was worried about that at first, but it really isn’t that big of a deal. Focus on the new guys and maybe collect new versions of your favorites, etc. Or if you never played the first just jump in and have fun. Kid tested, man-child approved. A solid 4/5 on our review scale. 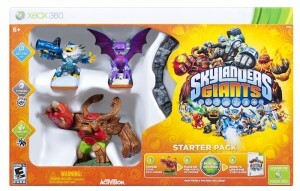 This Skylanders Giants review was based on the Xbox 360 version of the game provided by the publisher. Having not bought anything for either the first one or this one, I’m wondering if you can use the 2.0 figures on the original game so as to save some money? Great review Graev. Much appreciated. Here is a chart showing the compatibility. It looks like the new Skylanders and Giants are not backwards compatible, but the reposed characters are backwards compatible. I can’t wait to fly home for Thanksgiving so that I can give this a try! All of the GIANTS branded stuff also shows similar check marks or X’s letting you know if it works with both or just GIANTS. I found a picture for ya. Might be hard to see, but in the bottom right corner you can see the check marks. It makes things less confusing if you are worried about backwards compatible figures.